Want to get into a Ford Fiesta? There are a lot of drivers who are talking about this up-and-coming small car that has gotten high marks in safety, reliability, and interior. The interiors are spacious with a lot of room inside for five people and cargo. You also get a well-thought out design of the center console and touch screen LED. This makes it easy to command everything from the driver’s seat. Ford has really focused on designs that are safer for drivers and passengers in all kinds of ways. There are new driver safety features such as blind spot monitoring, lane departure assist, traffic safety alerts, and other new diagnostics that can help you drive better and get where you’re going safely, no matter what the weather conditions are or how the traffic is moving. 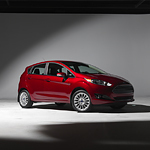 Test drive the Fiesta at Mike Molstead Motors located in Charles City and get a look under the hood, too.